Author's Forward Note: I was cleaning out an old binder of mine yesterday when I found this story (among some other oldies)- which is, in fact, the very first Neopets story I ever wrote. I was very happy and excited to find this, having thought it long-lost quite some time ago. I was only eleven when I wrote this; I was a young, bright-eyed, bushy-tailed n00b, so to speak. I'm now eighteen years old (yes, I know, quite ancient) and I decided, for the sake of posterity and just for fun, to submit this story to the Neopian Times like I'd originally planned so long ago. I submit it relatively untouched except for some extremely necessary polish work (e.g. spelling, grammar, sentence structure) that I had to do. It was an early winter morning in Neopia Central. The sunlight slowly crept over sleeping houses, including a strong, brick neohome with six cloud bedrooms. The warm light played gently into Fantasy's room and softly shone on her face. The red Ixi smiled at its warmth and wrinkled her nose at the idea of getting out of her warm and comfortable bed. She sighed, squinted one eye open and then the other. Finally, Fantasy yawned, practically rolled out of bed, and she trudged downstairs to find her owner, PrincessLucille1, making breakfast. The tall, fair-skinned girl with long brown hair was standing at the counter while vigorously mixing something in a bowl. She raised her green eyes at the sound of Fantasy's arrival and smiled warmly. "Good morning, Fantasy," she greeted her neopet breezily. "How did you sleep?" "Like a log," replied the Ixi, tripping over a certain petpet's bowl. She pulled out a chair and sat down. "Where are the others?" she asked as she tried, in vain, to smother a huge yawn. Fantasy yawned another whopper of a yawn. "Oh. What's for breakfast?" she mumbled sleepily. "Oh boy!" sang the Ixi, straightening up in her seat and radiating with new-found energy. "Well, you can 'oh boy' yourself back upstairs and wake your sisters," laughed Lucille, "because breakfast will be ready soon." Fantasy, suddenly fully alert, rushed upstairs. In a flash she was prancing back downstairs again, grinning from ear to ear. "Tee-hee! They're awake, now!'" The third and fourth-born siblings, Glimmer, a yellow Uni, and Emerald, a green Peophin, slowly came downstairs with eyes dull from sleepiness. Lucille shook her head with amusement. "Where's Sparkle?" she asked, referring to her youngest neopet, a blue Uni. "HERE I AM!" came a shout, quickly accompanied by the sound of someone scurrying frantically down the stairs, a brisk gust of wind and a flash of blue, and there stood Sparkle before her owner. She smiled brightly up at her and hugged her lovingly around her legs. "Good morning, Lucy!" she squeaked happily. "Same to you, little Shimmer," came the kind-toned reply. Just then, Snowflake came up. "Sorry I took so long, Lucy," she grumbled. "I couldn't find those dumb napkins for the longest time." "It's alright, just put them on the counter..."
Just then, the back door flew open. "I'm home!" came a cheery call. The door was heard to slam not-so-gently shut (while a voice sheepishly cried "Oops!") and Janelle came walking into the kitchen with her arms heavy-laden with bags. "Just in time, Jan," Lucille declared. "Set those over there and we'll deal with them after breakfast. Sit yourself down and rest those poor arms! Glimmer, don't forget to feed Snowdrop," Lucille said as she flipped a pancake neatly in the pan. "Snowdrop!" called Glimmer. From out of nowhere bounded a snow kookith, bouncing up and down, looking eagerly at the plates of steaming pancakes. "Sorry, Snowdrop; those aren't for you. You have to eat your own food," Glimmer giggled. The tiny, fluffy, cube-shaped creature looked like someone had died. He sadly sat down, raised his head, and slowly blinked his sad, ink-black eyes. It was a pitiful sight indeed. "Oh, alright, you don't have to go that far," Lucille laughed. Picking up a pancake, she tore it into very small pieces then mixed it in with the petpet's food. The snow kookith leaped into the air and raced to his food bowl. Snowflake smirked, her usual snarky (but well-meaning) self, then spoke up. "Can we start eating already? I'm starved." Everybody readily agreed, and breakfast began. Fantasy and Sparkle were sitting in the garden talking about their dreams. Janelle and Snowflake had gone to their friend's house, and Glimmer and Emerald were going to be out for the day in Neopia Central. The two youngest neopets are very close to each other. Though sisters, they are the best of friends. They simply love spending the day together. On this particular sunny morning they were passing the time talking about their favorite subject: the Faerie Paint Brush. "Wouldn't you just love to have beautiful faerie wings so gorgeous that everyone would stop to admire them?" sighed Sparkle longingly. Fantasy giggled. "And the so-called 'cool girls' at school would be so jealous they'd blow their tops off! They'd turn red, then purple, then a hideous shade of green!..." They snickered and guffawed at the thought. "And," Sparkle added, "the teacher would think us some royal princesses, and she wouldn't dare give us homework!" This time they laughed so hard that they started rolling on the ground. When they finally got control of themselves they sat back down on the porch swing, and the conversation took a more grave, serious turn. "I've been looking for a Faerie Paint Brush for a long time. I have never even seen one before, except in picture books and magazines." Fantasy sighed deeply, a wistful look on her face. Sparkle smiled wryly and put an arm around her. "Neither have I. Don't worry, though, I'm sure we'll find one someday." The little Ixi, never one to stay cheerless for long, suddenly brightened up with youthful enthusiasm. "Hey! Why don't we go exploring today and see if we can find it? We don't really have anything else to do, and who knows? Today may just be our lucky day!" "Great idea, Fantasy!" the other said, clapping her hooves excitedly. "Let's go!" About an hour later the blue Uni and red Ixi were skipping down a street among the shops. "Why don't we look around in the shops now, Sparkle, and not just in the windows like a couple of lost tourists?" Sparkle giggled, and bobbed her head in agreement. They trotted down the road a little further before Fantasy suddenly stopped them. "This way," she directed. She started to run and Sparkle was forced to hurry after her, a little confused. A short while later the Ixi stopped in front of the Shop Wizard's hut. "Let's go in here, Shimmer. I've gone her a gazillion times without success, but I might as well try today," explained Fantasy. The two neopets walked in. The Shop Wizard greeted his painfully-familiar visitor with a somewhat nervous smile. "Ah. If it isn't Fantasy393magic... and her sister, Sparkle_shimmer7, I presume? Let me guess, kiddo, we're looking for a Faerie Paint Brush, right?" "Oh yes, yes, PLEASE!" begged Fantasy. "A-A-Alright," he replied with a long suffering sigh. He'd done this so many times he could do it in his sleep! He used his magic for a few, brief seconds, then slowly turned to the youngsters with a dour expression. "Sorry, I did not find anything," he began with his usual negative, monotone response, but then he caught sight of Fantasy's glaring gaze. "Please t-try... ah... *cough*... aherm, em... Sh-shall I search elsewhere?" Sparkle couldn't help folding her arms and tapping her hoof. After walking about half a block away from the Shop Wizard's place the two neopets threw away any remnants of politeness and groaned loudly, throwing their heads back in exasperation. "That wizard ought to be fired. He can't find ANYTHING!" complained Fantasy miserably. "I totally agree with you," grumbled Sparkle before sighing deeply. "It seems like we've tried everything." She stood up on her rear hooves and threw her front hooves into the air in defeat. "At this point we just might as well look in every shop in the Marketplace," she said with a sarcastic tone. Fantasy stopped dead in her tracks. She turned to her sister, her eyes sparkling with glee and her ears pointing perfectly straight up. "Now that is an idea! Come on!" She then turned and galloped ahead. Sparkle stared after her for a few moments before rolling her eyes. "Why, oh why did I open my big mouth?" the Uni moaned. It was when they reached the fifteenth shop that their luck changed. "Look Sparkle, here's a shop called 'Faerie World'; that's a likely place to find a Faerie Paint Brush, don't you think? Come on, let's go in." The two girls looked in the huge store for a long time but without success. Finally they split up so they could cover more ground. As Sparkle wandered through a very interesting isle, something caught her eye. She was so excited that she began to scream. "Fantasy!! FANTAS-EEE!!! F-F-FAERIE PAINT BRUSH!!!" Scarcely had she finished screaming than the red Ixi had rushed to her. "Where, WHERE?!" "Right here!" Sparkle cried, holding the magical paint brush triumphantly in the air. "Well, what are you waiting for, silly Uni? Let's buy it right this second!!" They rushed to the checkout. The clerk, a teenage fire faerie, smiled at the two. "What can I do for you, girls?" Fantasy managed to recover her breath sufficiently and she gently placed the Faerie Paint Brush on the counter. "We'd like to purchase this, please." The faerie blinked with surprise, raised her eyebrows, and looked from the two little neopets to the paint brush and back. "You, uh, carry that much?" she asked in a skeptic voice. Not understanding the comment, Fantasy glanced over at Sparkle, who simply shrugged. Not knowing what to say on the matter, Fantasy simply ignored the comment and reached into her pocket. She pulled out a handful of neopoints and dropped it onto the counter. Sparkle followed suit and searched her own pockets, and upon finding another couple handfuls of neopoints, added it to the small pile. Fantasy quickly counted it all and smiled up at the fire faerie. "Well, here are 2,350 neopoints, Miss. Whatever change there is, I'd like it in fives and tens, please." The faerie had to swallow a laugh and hide a smile behind her hand. She disguised it as a cough and then looked down at the innocent youngsters with all the seriousness she could. "I'm sorry, but the price is 100,000 neopoints." Fantasy began trembling, and Sparkle's big blue eyes swelled up with tears. Sparkle managed to whisper hoarsely- "100,000 neopoints? Are... are... are you sure?" The clerk, realizing that the kids had been quite serious, replied as gently as she could, "Not exactly. 100,000 is the gallery price. If you wanted to buy it, you would have to speak with the owner and haggle the actual price, which is over a million neopoints at this time. I'm... I'm really very sorry, girls." She bit her lip, worried by the distressed looks on their faces. "Is there anything else I can do?" "No thank you," Fantasy said briskly. "I just remembered, I-I have to be... somewhere..."
The red Ixi then took off at break-neck speed, but not before a giant tear trickled down her cheek. Sparkle excused herself and raced after her sister as fast as she could. "Well, Glimmer, I'm glad that you and Emerald decided to spend the rest of the day at home. I was getting lonely here, with Janelle and Snowflake gone," Lucille said as she sat at the table, helping her yellow Uni and green Peophin with a jigsaw puzzle. Glimmer nodded. "I'm glad, too. Emerald and I were going to do some more stuff, but we were tired, and we'd rather spend time with you and keep you company." Her owner smiled. "Aww, that's sweet of you!" Emerald took another sip from her pop and then spoke with a wink. "Well, even if we weren't tired, we probably would've come home anyway so we could be with you. Wait... GlimmerPrincess, silly, I think this piece goes there and that piece goes here. . ."
Just then the door quickly opened and slammed shut with a tremendous noise. "Don't slam the door like that!" remonstrated Lucille as Fantasy ran in. "Fantasy! What?..." Lucille never got the chance to finish speaking, for the red Ixi sped right past them; she didn't make any eye contact, and no greeting was heard from her, either. Her ears were dropped low and her face was grim as she bounded up the stairs. Lucille just stared, Glimmer held her puzzle piece in mid-air, and Emerald's jaw dropped. "What on earth is the matter with her?" the green Peophin asked in astonishment. Glimmer just scratched her head, puzzled. At that moment the two oldest siblings walked in. "That brat should look where she's going," said Snowflake crossly. "I nearly fell and broke this beautiful clay vase Tatiana made for me! Imagine! The shame of it!" Janelle frowned at Snowflake's rather unkind remark before speaking up herself. "I guess Fantasy must be upset or something, because she just totally ignored us." Lucille shook her head. "This just isn't like Fantasy," she said, concerned. "I know her well, and I think this is very serious. Suddenly, Sparkle staggered in. She was panting heavily and gasping for breath. Without waiting for her blue Uni to say anything, Lucille asked: "Sparkle, what's wrong with Fantasy? You've been with her all day, so you should know what's going on, right?" Sparkle stood there gasping a while before she finally managed to speak. "Fantasy... found... *gasp*... a-a... F-Faerie... Paint Brush..."
All eyes were on her. "What?!" the others exclaimed in unison. Sparkle sat, gulped down some water, and slowly explained everything that had happened. "I see now," Lucille murmured. "I should have been a better owner. I'd never told her- or you, Sparkle- how expensive a Faerie Paint Brush is, and that... well..." Lucille sighed miserably. "The facts are that with six neopets, and with me not being a very fantastic gamer, we live on very meager earnings. We are far from wealthy and I doubt I will be able to buy any kind of magical paint brush anytime in the near future. I really try hard, but..."
The neopets hugged their owner. "It's okay," Glimmer whispered. "We live very well, anyway." Lucille offered a weak smile. "I'm glad that you understand, but what will we do about Fantasy?" she said as she gestured wearily to the stairs. "Let me go talk to her," said Janelle quickly. "I think I know what to tell her." Lucille regarded her for a moment, then gave her consent. Janelle went up the stairs quietly and walked to Fantasy's door. She knocked gently. At first there was no answer, but then Fantasy- so quietly that she was scarcely audible- spoke up. "Come in." The cloud door opened easily, the eldest neopet stepped in, and her hooves lightly click-clacked, click-clacked as she walked across the shiny, wood floor. Fantasy's face was buried in her pillow as Janelle approached her and sat next to the bed. "I know what happened... with the Faerie Paint Brush and everything." "Well, I understand how you feel." "Yeah, good one. Did PrincessLucille1 tell you to say that?!" snapped Fantasy as her ears went flat against her head." "No, and I really meant what I said, honest." Fantasy then turned onto her back, revealing her tear-stained face, and she stared hard at her sister with a look of defiance in her eyes. "How? How could YOU understand how I feel?" Janelle got up, went to Fantasy's window, and looked up at the sky. "Before Lucille adopted me, I was in the pound a long time... for years. My cage was one of the few that had a very small, very dirty window. Other than watching hopefully for a possible new owner, I spent most of my days peering out that window, gazing at the sky and the clouds. I wished that I was a cloud so I could float away and up into the sky where no one could catch me. "One day I caught sight of a Cloud Buzz flying by. She was so lovely, so happy and free-looking, that from that moment on I dreamed of being painted Cloud. In my mind, clouds signified freedom and joy, and I believed that someday, if I were painted cloud, that would mean that I could be eternally happy. I became obsessed with the idea and thought of nothing else, not even of being adopted as I used to dream. "Over time I allowed myself to begin to pine away. The little strength I'd fought to keep was fading fast. The small amount of hope I'd clung to was gone, and the small happiness I'd forced myself to find in my daily gaze out that window also disappeared. I was fading fast." By then Fantasy had sat up, seated herself far on the edge of her bed, her eyes wide with mixed horror and fascination. "What happened then, Janelle?" The green Uni, pleased at having gotten her little sister's interest piqued, smiled and sat back down next to her. "Well, finally it happened that I had but a single hit point left to my name. Then, all of a sudden, my once-biggest dream came true. I'll never forget it. Lucille, Snowflake, and Glimmer walked in and rescued me from that horrid place. They took me to the doctor, who then gave me every potion and witch's brew that he could think of, all of which quickly brought my health statistics all up to their normal levels. I was still weak, of course, and desperately in need of a good grooming, but I was free, and I was adopted by a new family." "I remember!" Fantasy exclaimed with sudden vivacity. "I was really-super-duper little then! You guys came home and we showed you your new room, and we had a big, huge dinner, and we watched a movie, and we played board games, and we-"
"Yes, yes, I remember too," laughed Janelle. "And I was very happy. Of course I still wanted to be painted Cloud, and to be honest, I still do... but you know what I learned, Fantasy?" The little Ixi shook her head solemnly. "I learned that the color of my fur couldn't, and shouldn't, define my happiness. Only the things that truly mattered in life could ever make me feel fulfilled, things like family, affection, love and tenderness. There will always be a new brush, a new item, but people like Lucille and our sisters come once in a life time. They are unique... and a cold dip in the Rainbow Pool only lasts an instance, the excitement of a new color for but a short while. The love of a family is lasting. Faith is lasting. Those are things that should be the focus of our lives, not paint brushes. We can dream about them, work hard and hope to acquire them, but they should not be our sole goals." Janelle smiled sweetly at her little sister, and enveloped her in a warm hug. "Anyhow. I know how disappointed you are, and I truly understand how you feel... but do you understand?" Fantasy nodded, her eyes dried and a smile now on her face, too. "Yes, Jan, I do. Thanks... and I'm so glad you're part of the family. You're the best big sister in the whole world! Well, next to Glimmer and Emerald, of course." Janelle grinned. "What about Snowflake?" Fantasy giggled. "Ehh... I'll get back to you on that." The two of them shared a laugh, shared another hug, and then headed downstairs together. The six neopets walked, skipped, and trotted next to their owner. "That was the best restaurant I've ever been to!" exclaimed Emerald. "How about the movie?" questioned Glimmer as she twirled twice. "Wasn't it exciting? And mysterious?" "Sure was," agreed Snowflake. "I'd like to see it again sometime! Maybe we can even get it when it's released for sale!" "And thanks for the trip to the Chocolate Factory, Luce," added Janelle happily, "That's a real treat!" The group headed home thinking of the wonderful evening they had, while ahead of them the sun was sinking below the horizon. "What are you thinking about, Fantasy?" asked Sparkle, for the Ixi had a far-away look in her eyes but a content smile on her face. "Lucille said that she has several rare battledome items that she's going to put up for auction," Fantasy replied, "so she can start to save up for a Faerie Paint Brush." Sparkle grinned teasingly. "So who'd get painted with the first brush, you or me?" Fantasy shrugs. "We'll see. Anyway, I can wait. I'm not impatient. I've got so much to be thankful for!" Before her surprised sibling had a chance to respond, one of those small "Something has happened" boxes suddenly appeared right next to Fantasy. It read: "You find a Faerie Paint Brush Plushie on the ground." 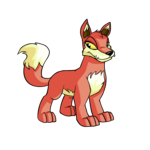 The red Ixi saw it, smiled excitedly, then picked up the plushie and ran after the others to show them her find. Sparkle was left in her wake, shaking her head in amazement before trotting after them. "Wait for me!" she called out. That night, as Lucille tucked Fantasy in, the Ixi spoke up in a small voice. "Lucille? Will you promise not to worry about me being unhappy because I might never get a Faerie Paint Brush? I won't, you know. Really I won't." Her owner promised, then smiled fondly. "I know you'd be disappointed, but I know the kind of neopet you are. You're such a joyful girl, and you're heart is in the right place." She kissed her on the forehead. "Good night, Fantasy." "G'night, Lucy," murmured the Ixi sleepily, her eyelids drooping low as Lucille exited the room. She snuggled down under her fluffy blanket and held the paint brush plushie close to her heart. Fantasy sighed. She would wait, perhaps years, for her dream to come true. Even if it didn't come true after all she still would not be sad, because she had her family and that was a blessing enough. Yes, it was the blessing that Janelle had always wanted, and Fantasy also felt blessed to have her, as well as her other siblings, and her wonderful owner. She was set on one thing if nothing else: the key to happiness is love, not some silly old paint brush. Author's End Note: A lot has changed since this story was first written. I now have eight neopets, not six , and they have all been painted. Yes, Fantasy is now Faerie; she has finally achieved her dream of having gorgeous wings. Drop me a neomail if you liked my story, and thank you for reading! Cheers! Saving for Packrat isn't so easy when there's a giant squid alive in there. When I was first made, my owner showered me with gifts. I was the first pet my owner had, and I knew I was pretty special.